I've recently taken on odd jobs at my work. A little copy writing here and there. Some event planning. Some video stuff. It's pretty cool - considering the only real reason I am probably offered these things is because people like my funny, passive aggresive emails. They trust me enough that I won't embarass them in front of a client. In a brainstorm meeting for tofu, one of the team members brought up something she had seen to the client. A shirt that said, "The Beets - Tofu Tour" she thought it was really cool that some band had a tour named after tofu. "That's from the cartoon, Doug. 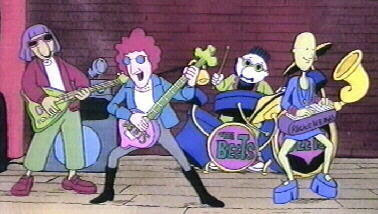 The Beets was his favorite band and Killer Tofu was their big hit." but you can't make her a grown-up! I used to love that cartoon! The theme song still gets stuck in my head sometimes! I *still* get called Patty Mayonaise... all the time.